James Parkinson was a physician and chemist, born in 1755. In 1817 his pioneering work “An essay on the shaking palsy” established the foundation for improved knowledge, study and understanding about the collection of symptoms – tremors, rigidity and slowness of movement. After his death, in recognition of his contribution the illness became known as Parkinson’s. I am pleased to report that after nearly a year I have seen a general neurologist. He was very pleasant and I was delighted that he likes to look at the whole picture rather that just focusing on pills. I was able to tell him about Dance for Parkinson’s which is becoming more and more popular. My left foot is rather claw like first thing in the morning which can be quite uncomfortable. It could be an indication of under medicating and I may need to consider taking something at night in the future. Firstly, I think I must try more stretchy foot exercises and have my spiky ball to hand. Thus checked out it was time to board the plane and set off to visit the lovely daughter “down under” for a month. Our first activity was a visit to a gin distillery where we added a variety of botanicals to a juniper and coriander base. As a non gin drinker I was pleased that my completed bottle was surprisingly pleasant. The amiable husband was more confident and skilful and very happy with his final result, it seems to be going down well! 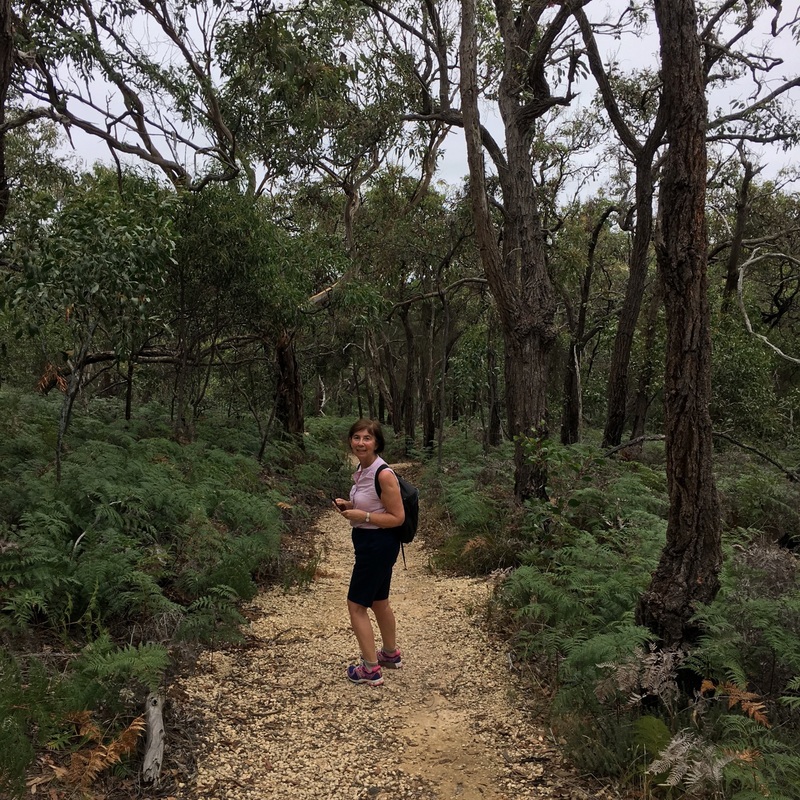 We then headed for Tasmania and revisited the beautiful Freycinet National Park where we walked to Wineglass Bay and back via Coles Bay, a 12kms trek which seemed more taxing than we remembered from a number of years ago! Back in Hobart we travelled to Bruny Island where a 3 hour exploration of the coast in a jet boat was a thrilling trip with a viewing of a rare albatross plus many other sea birds and fur seals. On Mother’s Day we drove to to the start of the Great Ocean Road near Torquay and walked part of the Surf Coast Walk, great fun watching all the fanatical surfers, finishing up with fish and chips at Anglesea Surf Life Saving Club. When we are in Melbourne my favourite walk is along the coastal path with views one way of the city, the other towards the Marina. I enjoy finding a quiet space in a sandy bay to read or watch the activity around me, kite surfers jumping high in the air as they twist and turn are wonderful to watch. The photo is of the Brighton Bathing Boxes which have been part of the beach landscape for over 100 years. Home again and time to prepare for Parkinson’s Awareness week from April 8th – 15th, lots happening everywhere. Our local choir, the aptly named Good Vibrations, will be performing on the 7th to kick off events in Mid Sussex. Glad to hear you have been enjoying yourselves down-under. I’m sure it was good to see your daughter and spend quality time together. Thank you for our regular positive update. Good luck with the singing and dancing.